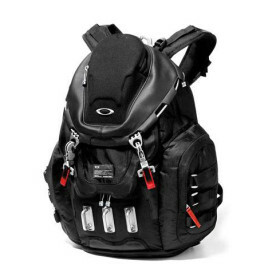 Oakley Kitchen Sink Backpack » Protective Solutions, Inc. Outfitted with serious hardware and versatile storage options, the Kitchen Sink Backpack is a complete package with heavy–duty appeal. Whether taking a day trip or extended excursion, specialized pockets inside and out organize items while abrasion–resistant fabric keeps them safe, including shoes and most 17" laptops. A padded back and adjustable mesh–lined shoulder straps keep you comfortable and cool when hauling over long distances. Equipped with a hard media–player compartment and reinforced clip and zip closures, the Kitchen Sink Backpack blends toughness, style and diverse function ideal for the unpredictable day.